Pollux (Italian: Punta Polluce) is one of the two peaks known as the Twins. 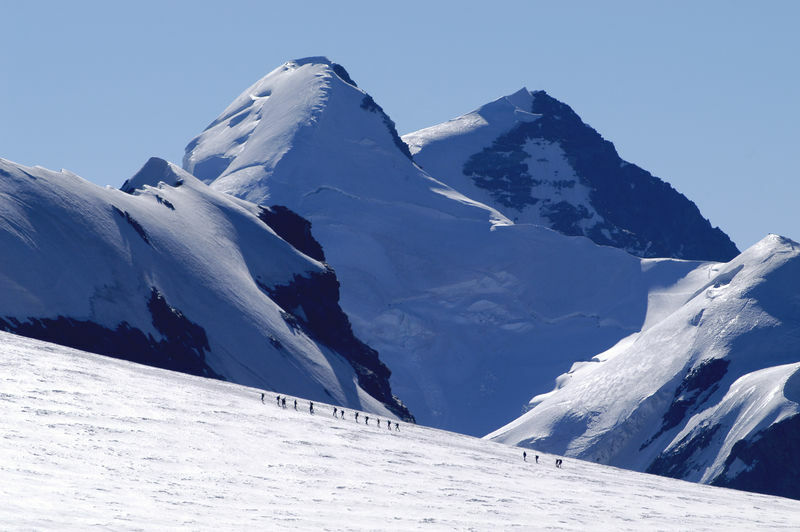 With a height of 4,092 m, it is lower than its twin brother Castor. 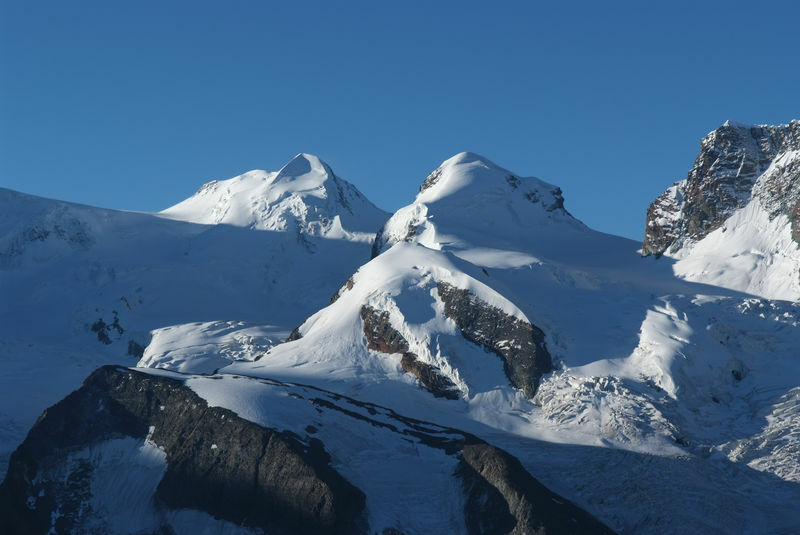 Both mountains lie between the Breithorn massif and the Liskamm, with Pollux lying to the north-west of Castor. They are separated by the Zwillingsjoch (Italian: Passo di Verra, 3,845 m). 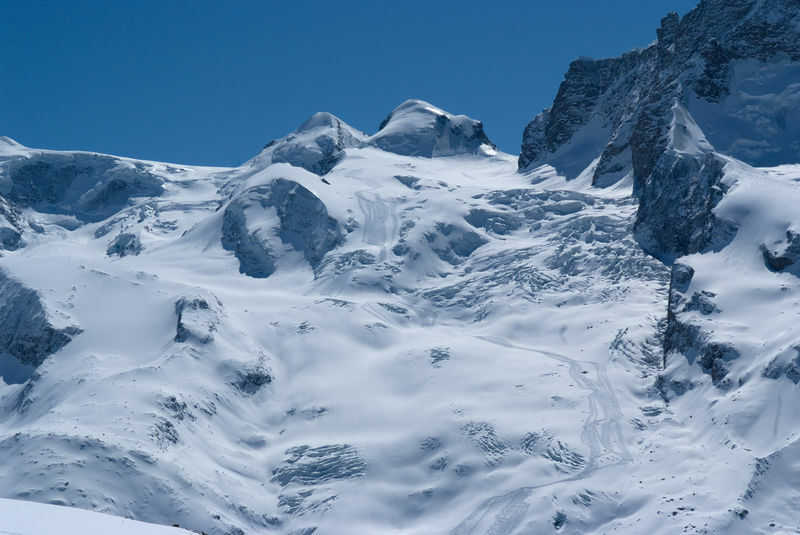 The ascent involves a glacier crossing and climbing on rock. Pollux is named after one of the Greek twins Kastor and Polydeuces, sons of Zeus. The Latin names Castor and Pollux are used here, however. Polydeuces was the son of Leda and Zeus, who appeared to her in the form of a swan. The Ancient Greeks disagreed about Castor’s origin, however. For some, he was the son of Leda and her husband Tyndareos, and was conceived in the same night as Polydeuces. As they were conceived in the same night, they were twins and inseparable, although, as the son of Zeus, Polydeuces was a half-god, while Castor was a mortal. Others believed that, like his brother, Castor was also a son of Zeus. Both of them took part in the voyage of Jason and the Argonauts in the search for the Golden Fleece, and they also accompanied Heracles on his journey to the Amazons. The end of the Dioscouroi (sons of Zeus) was initiated by a quarrel started by Castor with his cousin Idas. Idas slew (the mortal) Castor, after which Polydeuces killed Idas’ brother Lynceus. Zeus then intervened by destroying Idas with a bolt of lightning. Being immortal due to his paternity, Polydeuces thereafter mourned his brother, and asked his father to take away his immortality so that he could join his brother in the Land of the Dead. Often, however, they are both described as sons of Zeus: both immortal and, together with their sister Helen, also a daughter of Zeus, born from a single egg or as a pair of brothers from a second egg. They were considered the pride of Sparta.